The stripper was of course the chemical sort to get me down to bare metal on the underside of my car. There are so many innuendos I could use for this post, but I wont go down that route. The day was of course at Mustang Maniac where my day of hard work was to begin. The car looks quite menacing when you stand there with just a three-inch scraping knife. I used some stuff called Starchem – Synstrip. This has been given quite a few reviews on how good it is. The old school strippers like Nitromors has had an ingredient change due to new laws or health and safety for what ever reason. The results speak for themselves, they don’t work like they used to. So this stuff is one of the few old school strippers left out there that you can get your hands on. Professional use only with disclaimers all over it on the label. It took notice and used goggles, face mask and gloves. Is the stripper any good? I shall review it fully soon, but it does burn like hell on your hands, that should give you an idea. Anyway the car was given a good slap of the mixture on the under seal and it was obvious it was attacking not just paint but under seal, tar and any other stuff sprayed on it. It was going to be a long day, the first attempt removed a lot, the second exposed the base paints and we were almost there with the third. Why take it all off? Well, we wanted to see what was under the sealers to see what work need to be done or what filler needed to be removed. So a tip is – don’t buy a car that looks great as it could be covering a multitude of sins. It’s better to see bare metal and you know exactly where you are. I exposed a bit of filler around the welds, nothing to bad as it was just to smooth it all out. There was some real good clean metal by the tunnel gearbox area and a little surface rust on the rear panels by the fuel tank partition. The work was slow, made my arms ache and Adam gave me hand towards the end of the day too. What a difference it has made already. I will start on the other areas next week if I have recovered enough by then. Hopefully there will be a lot more bare metal all round next time. The process is apply the liquid, let it bubble up, scrap it off, add more, rub it in with wire wool, scrap it all off and repeat. The pictures I took after each treatment, you can’t really see a huge difference between the sessions, start and finish there is a difference. After the third session and the end of the day, we rubbed the chemicals down with thinners to see the bare metals. The surface rust will be attacked again with a little aggression where I can. Anything that looks bad – we will replace and patch properly. Well that was all day Saturday taken care off, Sunday I was rubbing down my driver’s side fresh air vent. It was a real mess and needed rubbing down, primer, and a couple of top coats. I have added the full process under my Photo Menu – Inside The Car – Drivers Air Vent Refurbishment, or click here for the quick link. Here are a few pictures of the before, during and after. My arms are killing me and I am pleased with the results. for both days. On the assembled pictures for the air vent the finger prints were my oily fingers, it wiped of clean. Unfortunately there is too much exciting stuff to look at here apart from different angles of course. I was well chuffed with the results, even if I do say so myself. 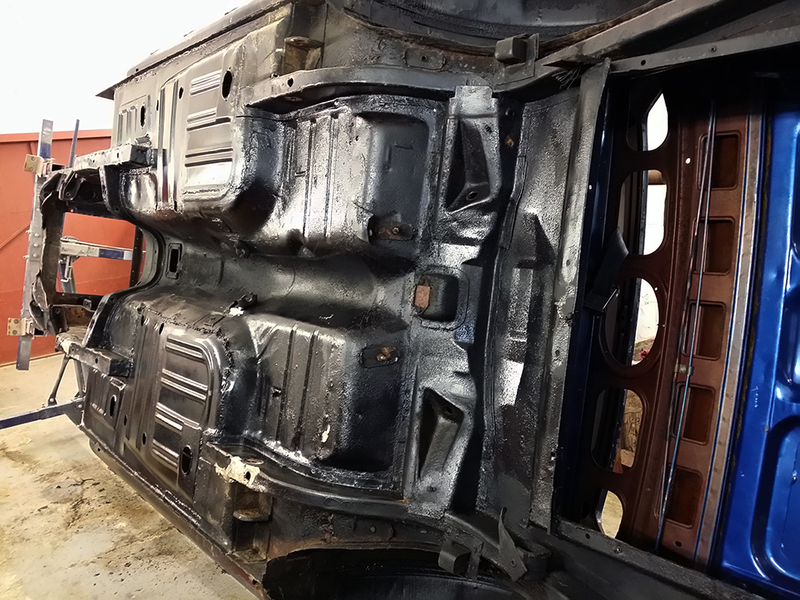 This entry was posted in Car, Photo's and tagged Chemicals, filler, fresh air vent, Mustang, paint, refurbishment, rust, Stripper, under seal, welding. Bookmark the permalink. Amazing. We have project cars, but I don’t have the time or energy to strip them down to nothing and rebuild them. But from following the process on your Mustang, I see that’s what it takes. I didn’t think it would be this intense to be honest either. But, I am now doing it properly with the help of experts and the best in their field as well. It will make a big difference and once she is done, she will out live me. 🙂 The end results are what I am thinking about. When my arms feel like they are going to fall off I think of the end result. It keeps me going.